I am sure some of you have been hearing the letters RTL-SDR come up more often. At the time all I knew was what the SDR part meant (Software Defined Radio) and didn’t really care about the subject. After hearing more and more I decided to see what all the buzz was about. The company Realtek (sounds familiar?) designed an IC chip called the RTL2832/RTL2832U (USB 2.0) that was originally used by electronics manufacturers that made DVB-T (Digital Video Broadcast – Terrestrial) receivers. These devices will display Digital TV signals from nearby TV stations (Remember the whole Digital TV upgrade that made older TV’s useless unless it has a converter) as well as digital FM radio onto your computer/laptop. The actual RTL chip demodulates the signal, cleans it up and processes the signal using a built in ADC (Analog to Digital Converter). All the software does is display the information that is coming out of the RTL and it will also control the frequency and filtering of the signal through a tuning chip on the board. It’s way more technical than that but I’m just giving you the basics. Someone found out that RTL chip with the tuner could allow you do sample/listen to signals from 64Mhz up to 1678Mhz (Varies depending on the tuner) which is quite impressive. 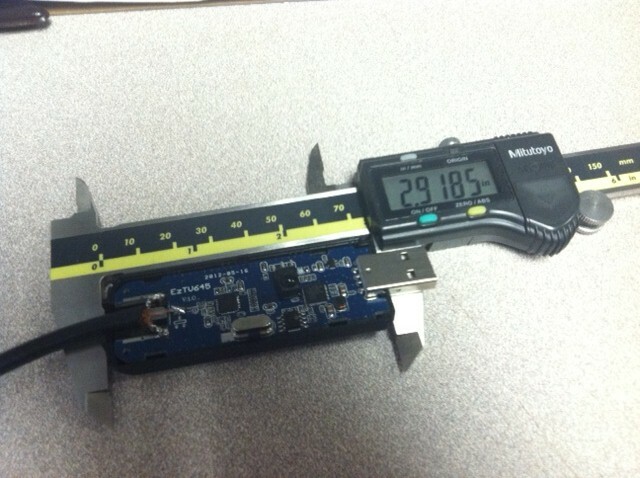 These chips could also decode many different modulations and you can view/sample megahertz at a time. All of this for around $20 USD and some software. 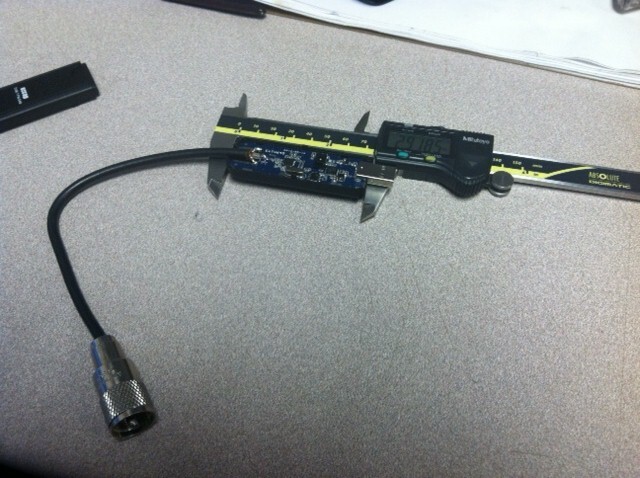 With some other tricks you can decode APCO25 (P25) or other digtal and digital type signals with this dongle. In short terms you have a Software Defined Receiver (SDR) that you can listen and actually SEE any signals from around 64Mhz to around 1678Mhz at around 2Mhz at a time. For example you can listen/watch a good portion of the 2M (Let’s say from 146.000-148.000Mhz) band and see all the conversations going on in that 2Mhz span. Depending on the software you’re using, you can filter just what you want to hear while seeing what else is happening . If you’re listening to a repeater, you can view the station on the input as well as hear and see the same station on the output frequency on 2M. If you tried to get the same features in a police scanner, you could be spending at hundreds of dollars. Is this too good to be true? What’s the catch? Is this a Scam? It does seem to be too good to be true but it’s actually true. 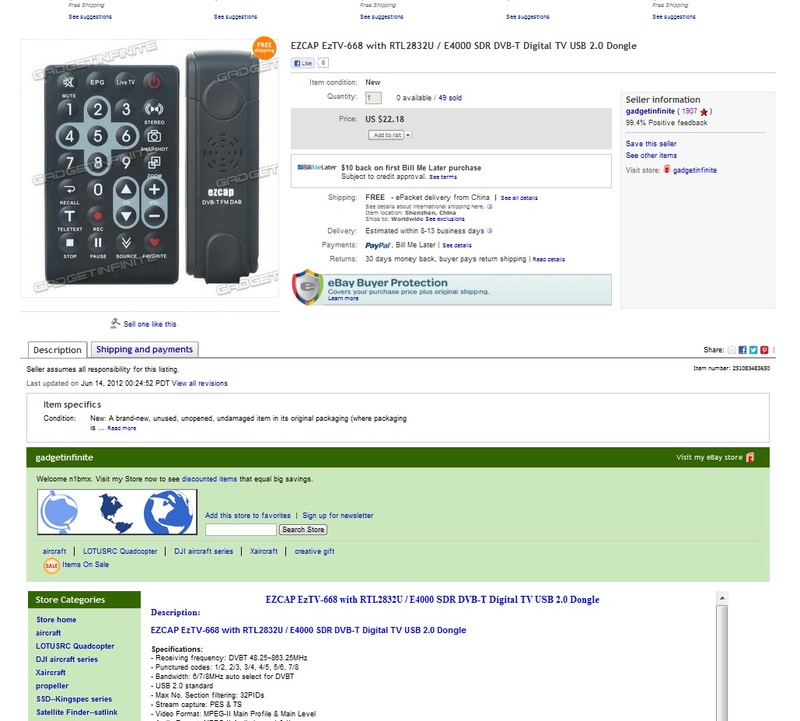 For around $20 USD, you can have a VHF/UHF SDR receiver. I have a feeling the price will go up as retailers are seeing a huge increase in sales of these “Cheap” devices. There are some catches however. It doesn’t have the best filtering so signals could get cross and mixed in. You’ll sometimes hear “Birdies” and there are times where the frequency displayed is not correct to the frequency you’re listening too (So far I’ve seen if off around 6khz). Another issue is with the dongle itself, depending on the manufacture the cases don’t have really any shielding and the antenna connection and the supplied antenna is basically crap. At the time of writing this, there are a couple companies seeing the demand for these RTLSDR’s and are making units with the correct case and antenna connection. But for the issues it has and for the price they are being sold at the moment, it’s well worth having. It’s almost comparable to purchasing a FunCube dongle for around $190 that is similar even though I think the FunCube is better and helps support AMSAT. Ok ok ok… You’ve sold me. How do I get one these $20 dongles? This should be the only battle you have to do. Securing the Proper Dongle at the correct price. There are many manufactures of dongles that do almost the same things. 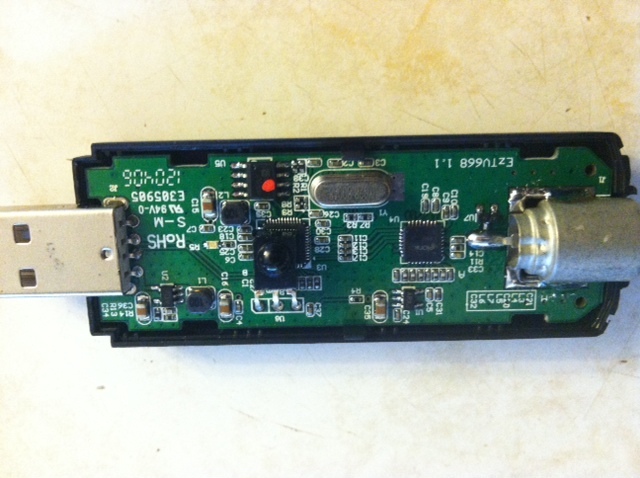 You want to find a dongle with the correct RTL chip and the correct tuner chip. The Cat’s meow of Chipsets are the RTL2832U and the Elonics E4000 (AKA E4K) tuner chip. Why? I have no clue. Some dongles have this configuration and some use other Tuners like the Fitipower FC0013 and FC0012 that work also. Some of the differences are the Bandsplit of what frequencies the tuner chip can tune. At the time of writing this, If you can get your hands on a EzCap EzTv668 (or EzTv666) with the RTL2832U and E4000 tuner then you are golden. However the company that designed and manufactured the E4000 is no longer in business and the company is now being liquidated. This means at this point in time the E4K is no longer being produced. Most companies are switching over to the FITIPOWER FC0013. So you want to make sure that you are getting a unit with the E4K. There are some ebay sellers that are claiming to ship dongles with the E4K but they are really the FC0013. If you happen to get stuck with one, don’t worry. It will still work. JUST TELL ME WHICH ONE!!! Grrrrr. That’s the thing… I can’t! Things are changing so much that its possible for something to be different next week. Have no fear! The good people over at /r/rtlsdr over at Reddit.Com (http://www.reddit.com/r/RTLSDR) have a very nice up-to-date list of dongles as well as places to purchase these dongles. Just take note that you’re still gambling when purchasing a Dongle. A lot of these are drop shipped from China and you’ll never know what you’ll get until it lands on your doorstep. Here is a Ebay “EzCap EzTV668” screen shot of one I actually purchased on Ebay. I purchased this from a seller on Ebay as well as one from Deal Extreme (DealExtreme.Com). The reason I purchased it from Ebay is the one I ordered from DealExtreme was taking way too long and when I contacted their customer service, I was told they were out of stock and could take almost another month for it to come in. 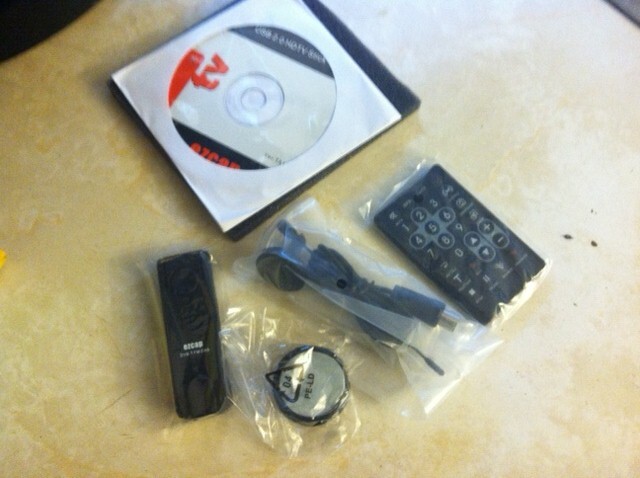 If you notice the Ebay Auction says RTL2832U and E4000 tuner… Well… This is what I got! It’s a EzTv645 and it has the Fitipower FC0013. This dongle is NOTHING like the advertised dongle on Ebay. I could have complained and returned it but as you can tell, I hacked it up already. I just wanted to warn you that you might not get what is advertised on Ebay. I added a Pigtail with a PL-259 which voided any warranty (if any) it had. I wasn’t going to waste time with trying to return someone that was sold over ebay and shipped from china. When soldering on the coax to the board. I messed up and used a powerful (too powerful) soldering iron without any grounding or ESD protection. You’ll see some of the signals being mixed and some other horrible stuff. I am not sure if this is how it is normally is or damage done from my soldering job. Also for some reason the video lost sync with the audio. The dongle still works but it’s in the hands of my co-worker who would really have fun with this. This is what you’re looking for. It’s the advertised 668 with the Elonics E4000 Chip (Little square chip to the right of the Antenna Jack) and the RTL2832U (Under the IR Sensor). I dared not to touch this one with a soldering iron. For now I went to Radio Shack and got a couple connectors (PAL to BNC). I would suggest going on ebay and getting the correct adapters or if you have a really good soldering station, solder in a SMA pigtail and/or connector. It looks and sounds much better than the one I purchased from Ebay. But I can’t tell you for sure since I hacked up the Ebay one before I can make a comparison between the two. The hardware finally came in… What now? That’s It!! It should be working. Tune around and have fun. If you’re using the antenna that came with the dongle, good luck! You will not pick up much with the stock antenna. I ended up cutting the plug off the antenna and soldering it to some RG-58 as to not mess up the board. You can also find adapters online and possibly at Radio Shack. The plug looks like an RCA but it’s really a “Belling Lee” (IEC 169-2) connector or PAL connector. Here are some RTLSDR websites that were helped me out and are resources for this article. http://sdr.osmocom.org/trac/wiki/rtl-sdr – RTLSDR website with more technical information than I’ll ever know. http://www.rtlsdr.com/ – Just catalogs RTLSDR feeds from websites and video sites. Just want to say thanks to all those on Reddit.Com (/R/RTLSDR and /R/amateurradio) and those on ##RTLSDR and other IRC channels on freenode/geekshed for helping me out.